The Ancient Greeks used letters to represent numbers and they could make very complex calculations in this way. The numbers 1, 2, 3, … had not yet been invented, which were later created by the Arabs. Nevertheless, Archimedes, based on geometrical and numerical calculations, managed to calculate the number of grains of sand on Earth, something unbelievable for his time, as the scientists of the period simply believed that the grains of sand are innumerable. His work, Psammite, is a landmark in mathematical science. The diaeresis ¨ : above the letter. The numbers 1, 2, …, 9 were α’ β’ γ’ δ’ ε’ ς’ ζ’ η’ θ’. The numbers 10, 20, …, 90 were ι’ κ’ λ’ μ’ ν’ ξ’ ο’ π’ ϟ’. The numbers 100, 200, …, 900 were ρ’ σ’ τ’ υ’ φ’ χ’ ψ’ ω’ ϡ’. The letter F’ was originally used for the number 6, but was later replaced by the stigma (ς or Στ). The more complex numbers were written as a line of letters, so that the sum would amount to that specific number. For example, the number 247 was written σμζ’ or σμζ, while the number 916 was written ϡις’ or ϡις. The thousands were written with the same letters, but were preceded by a comma. 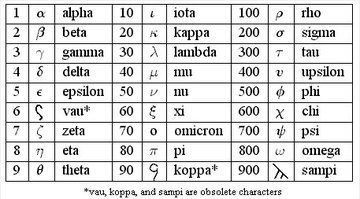 So, 1000 was ,α while 2027 was written ,βκζ’. For numbers greater than 9999, the term myrias (myriad) was used and was symbolized with the letter M, with the letters on top. For simplification purposes, Diophantus replaced M with a dot.